I was just married. How do I get my copies of the marriage license. The marriage license is your permission to be married. When you provide it to your Officiant on the day of the wedding (free of any stains or wrinkles); your Officiant will sign and file the license with the county. YOUR OFFICIANT (not you, not your wedding planner, not your friend, not your venue) is required to return the license to the county where it was issued to you within 10 days of the ceremony. If one of our notaries issued you the marriage license and the appropriate check was attached to the request forms, the county will mail the copies to you within 8 weeks. If you Obtained your marriage license from the LA County Clerk’s Office and you pre-ordered the certified copies, the county will mail them to you within 8 weeks. If you did not pre-order them, they will be available for pickup in 6 weeks. You can have them mailed to you. You can fill out a Request for Marriage Record form. You will need to submit this form to the county along with a notarized Certificate of Identity form and a check for $15 for each copy. These forms are available online at the county’s website by clicking here. You can also pick them up in person. Click here for the list of LA County Clerk locations. The copies should be available for you to pick up in 3-4 weeks. 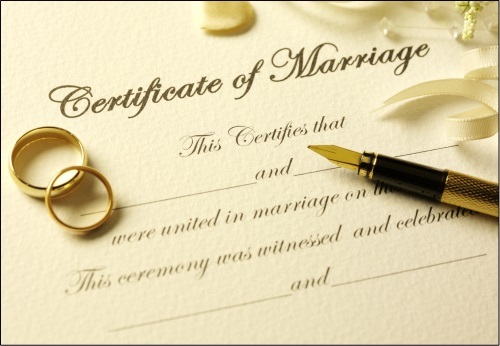 If you want them mailed to you, you can fill out a Request for Marriage Record form along with a notarized Certificate of Identity form and a check payable to that county for $15 for each copy. These forms are available online at each county’s website. Click the link to the county below where you obtained your license for information on obtaining your copies. After your wedding, YOUR OFFICIANT will submit the marriage license to the appropriate county clerk’s office. Once your license is submitted to the county, Your Officiant and/or Great Officiants will have NO access to the documents. If you have pre-ordered them from LA County and have not received them after 8 weeks, please DO NOT contact Great Officiants. First, please contact the LA County Clerk at 800-201-8999 to check the status. The clerk will ask you for your marriage license #, this can be found on line 25e of your customer copy if provided. If you obtained the license outside of LA County, please visit their website for instructions on how to receive your copies. If your county does not provide you with a customer copy, (like Orange County) please make an extra copy of your marriage license for your records. If the county ever needs our officiant and/or the notary to make corrections with a duplicate or amendment, we will do our best to guide you through this process. If there are any other issues we will quickly help you resolve the issue to the best of our abilities.